A fishing trip with Dennis Whiteside is like a journey through history, regardless of the stream or location being visited. His knowledge of Ozark and associated area lore is astounding, and all its waters are kin to his canoes and paddles. A myriad of stories -- insightful, educational, thought-provoking and often humorous -- flow from him like the water being visited, bringing the past, present and even the future into focus. You learn quickly that he's a student of conservation and a protector of precious land, water, fish and fowl. And if it's a float involving the fishing for smallmouth bass, you'll learn quickly that he knows each catch by its first name, and is it's premier friend and protector. My best friend and I have used Dennis on streams all over the western parts of Missouri and Arkansas for over twenty years. He is beyond a doubt the best smallmouth guide we have ever used! He knows the lures, the areas to cast, but not only the enjoyment of aways catching fish when we are with Dennis, he know the flowers, birds, animals, etc.,that always makes our trips so enjoyable. Dennis has put me on three (3) 20" inch smallies and countless 18" and 19" ones. My best friend and I have used guides all over the states and Canada and Dennis is the best, by far. I've been fishing with Dennis every summer for about 15 years and I thought I would add something simple to your collection. Most people will probably mention his fishing skills, his patience with novice smallmouth fisherman, and his determination to provide an excellent fishing experience. Some will bring up his in-depth knowledge of the Ozarks, it's history, and the people who inhabit the hills where he guides his clients. All of that will be true, but I don't want him to get too much of a big head. I hear that hat he wears is pretty expensive, and I don't want him to have to go out and get a larger model. What I will say is when I started fishing with Dennis my goal was to catch a bunch of fish, and eventually put a big reproduction on the wall. We have definitely gotten that accomplished. But at some point in our years together on the water I realized something truly important. I had made a very good friend. My 15 year relationship with Dennis has been fantastic. Not only do we always catch fish (sometimes big ones and sometimes a lot of them) but Dennis’s knowledge of the outdoors is vast, his manner is affable, and his common sense rounds the experience out. Not only do you get to see one of the most beautiful places on earth, you get to catch fish and solve the world’s problems. That is fishing! I found Dennis 15 years ago when my yearly trout float fishing trip with my son Kirby was threatened due to the lack of a guide. Thank Providence that we went small mouth bass fishing with Dennis! Since that time my 15 year relationship with Dennis has been fantastic. Not only do we always catch fish (sometimes big ones and sometimes a lot of them) but Dennis’s knowledge of the outdoors is vast, his manner is affable, and his common sense rounds the experience out. He has introduced me (my son, son-in-law, wife, daughter, and 6 of my friends) to remote areas in Missouri and Arkansas I would have never found. Fishing with Dennis is a world class experience, including the food you eat. Not only do you get to see one of the most beautiful places on earth, you get to catch fish and solve the world’s problems. That is fishing! Feel free to edit in any manner you like. If you need something different, let me know. Sorry for the delay in getting this to you, but I have been buried lately. Dennis and I need to go fishing soon! I was raised in the Ozarks and developed my love of smallmouth fishing at a time I lived on a little Arkansas smallmouth stream while attending the University of Arkansas. I didn’t know Dennis until a few years ago when I found his website and booked my first float trip with him. After wading smallmouth streams in Oklahoma’s Kiamichi mountains for some 25 years by myself it was easy to get used to the easier pace of someone paddling me down a clear cool stream in the Ozarks and exchanging stories about nearly every subject except politics and religion and stopping in some beautiful place to have our shore lunches and more stories. I’ve learned a lot about the early days in the Ozarks that I never knew even though I grew up there as well as a lot about the finer points of smallmouth fishing. After these few years, I now count Dennis as not only my fishing guide but one of my very good friends. We share stories long distance all year long even when we are unable to get together for a float trip. I’m always looking forward to my next trip with Dennis knowing that we don’t go if conditions aren’t right for a pleasant experience. There are countless natural treasures in the hills and hollows of the Ozarks, and Dennis Whiteside is definitely one of them. My father, son and I fished with him late in the fall of 2015 on the James River below Galena. 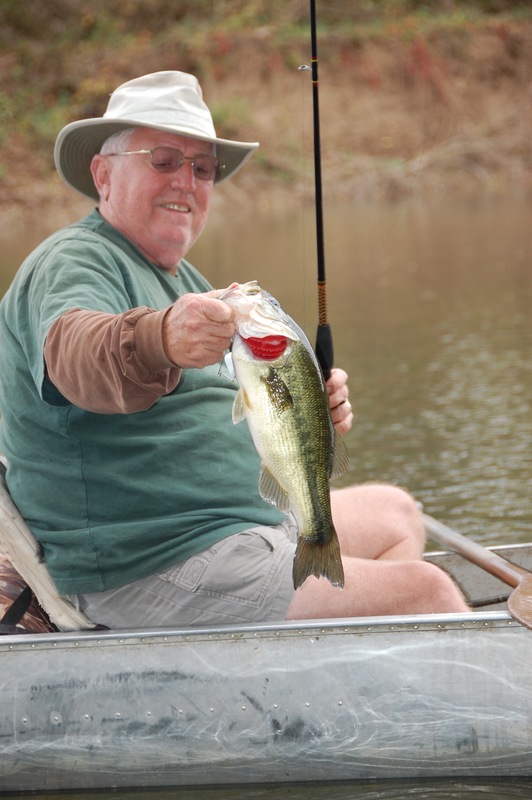 Mr. Whiteside's knowledge of southern Missouri's waterways, his skill with rod and canoe, and the personal joy he took in sharing what the land has to offer made for lots of fun, lots of fish and, most importantly, lots of memories for me and my crew. Dennis Whiteside is the perfect guide to share a day or a week with among hills that turn little boys into men, and that let men recall their time as boys. I would recommend him to any group large or small, young or old. I look forward to more time on the river with him again soon. For as long as I can remember, I've loved to fish. My grandma would take me fishing on creeks and ponds on our family farm back in the fifties and my love for moving water has never slowed. I can remember hooking my very first Smallmouth on our old farm at the sandgate eddy on Little Black River in about 1958. My Uncle Bill Whitley, who just turned 90, also allowed me to go with him on guided float trips in the early sixties on Missouri's Current River near Doniphan. I can easily recall specific fish that we caught from some of those float trips with our guide, Barry Price, one of several guides there at the time in the Price family. While in college at the University of Missouri in the late 60's I got to know the Dablemont family and spent many great float trips fishing and float hunting with Larry Dablemont and his dad, Farrel, on the Big Piney River near Houston, Missouri. Later, Farrel Dablemont made me my first wooden John Boat, I took it with me to Arkansas after returning from a year in Vietnam and have spent the rest of my life exploring near every clear, float stream in Arkansas, Missouri and Oklahoma while wearing out a dozen canoes doing it. Lord willing, I'll keep going a few more years and hope to share a good many river miles on more fine Ozark streams with fine folks that hopefully value the Smallmouth bass as much as I do.